Keppel Corporation was ranked as the top Industrial Conglomerate on Corporate Knights’ Global 100 Most Sustainable Corporation in the World 2016. Keppel Corporation announced the plans to consolidate its interests in its four asset managers – Keppel REIT Management, Alpha Investment Partners (Alpha), Keppel Infrastructure Fund Management and Keppel DC REIT Management – under Keppel Capital, a wholly‑owned subsidiary. 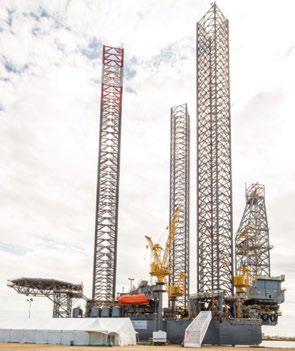 Keppel FELS delivered three KFELS B Class jackup rigs; Cantarell I and Cantarell II were delivered to Grupo R and Halul was delivered to Gulf Drilling International. Keppel Offshore & Marine (Keppel O&M) and Shell jointly won a licence to supply Liquefied Natural Gas (LNG) bunkering services in the Port of Singapore. Keppel Land added to its quality portfolio of retail and mixed‑use properties with the acquisition of a 22.4% stake in I12 Katong lifestyle mall in Singapore. Keppel Land China was conferred the Top 10 ASEAN Companies in China award by the China‑ASEAN Business Council. It is the only company to have received the accolade for four consecutive years. Keppel Land entered into a joint venture to develop a prime waterfront site in the Thu Thiem New Urban Area in Ho Chi Minh City, Vietnam. 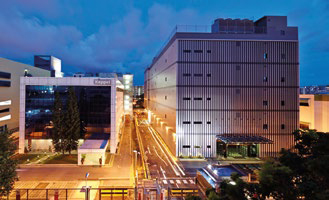 Keppel Data Centres Holding (KDCH) entered into a long‑term collaboration agreement with PCCW Global to co‑develop and market an international carrier exchange in Hong Kong, marking the expansion of Keppel Telecommunications & Transportation’s (Keppel T&T) footprint into the market. Keppel Corporation and Keppel REIT were among 24 entities to be listed on the SGX Sustainability Leaders Index. Keppel O&M completed the acquisition of Cameron’s offshore product division, which comprises the LETOURNEAU™ jackup rig designs, as well as rig kit, aftersales and aftermarket businesses. Keppel O&M entered into a shareholders’ agreement with Rosneft Oil Company and MHWirth to set up a Singapore incorporated Joint Venture Company (JVCO). The JVCO will establish a wholly‑owned design and engineering centre in the Russian Federation, focusing on the design and engineering of mobile offshore drilling units for shallow waters. BrasFELS was awarded a Floating Production Storage & Offloading (FPSO) module fabrication and integration project by repeat customer MODEC. Keppel Singmarine delivered a high‑specification deepwater derrick lay vessel, DLV&2000, to Hydro Marine Services, a subsidiary of McDermott International. Keppel AmFELS delivered one of the world’s largest Harsh Environment Enhanced Mobility land rigs. Keppel Land subscribed for VND 500 billion convertible bonds in Nam Long Investment Corporation. Keppel Land’s successful Selective Capital Reduction exercise was effected, resulting in Keppel Corporation gaining full ownership of the company. Keppel Land topped off Junction City Tower and opened Sedona Hotel Yangon’s Inya Wing in Yangon, Myanmar. KDCH secured $84.5 million in contracts to provide colocation and data centre services at Keppel DC Singapore 3. Keppel Infrastructure Trust (KIT) handed over 1‑Net North Data Centre to 1‑Net, which commenced its 20‑year lease. Keppel Corporation completed the restructuring of its four asset managers under Keppel Capital, a wholly‑owned subsidiary. Keppel Corporation ranked fifth in the annual Governance and Transparency Index and was selected as an index component of the Dow Jones Sustainability Asia Pacific Index 2016. At the 17th Securities Investors Association (Singapore) Investors’ Choice Awards, Keppel Corporation was awarded Winner of the Singapore Corporate Governance Award Diversity category, Merit of the Singapore Corporate Governance Award Big Cap category and Winner of the Internal Audit Excellence Award. Keppel O&M entered into a shareholders’ agreement with Shell to establish an LNG bunkering business in Singapore. Keppel FELS delivered its fifth high‑specification accommodation semisubmersible to Floatel International. Keppel AmFELS delivered Uxpanapa, a KFELS B Class jackup rig, to Central Panuco, a subsidiary of Perforadora Central. Keppel Shipyard delivered Armada LNG Mediterrana, an LNG Floating Storage Unit, to Bumi Armada. Keppel Singmarine secured contracts from Jan De Nul Group to build three Trailing Suction Hopper Dredgers. Keppel O&M won 35 awards at the Workplace Safety & Health Awards 2016. Keppel Land opened Saigon Centre retail mall in Ho Chi Minh City. Keppel Land entered into a conditional joint venture agreement with Shwe Taung Group to develop Phase Two of Junction City in Yangon. Keppel Land China and Alpha divested their stakes in Life Hub @ Jinqiao, Shanghai, realising an internal rate of return of over 20%. Keppel Land China announced the acquisition of a newly‑completed retail development in Shanghai’s Jiading District. Keppel Seghers handed over the solids stream and sludge treatment facilities in the Doha North Sewage Treatment Works to its client, and commenced the 10‑year operations and maintenance phase of the contract. KDCH secured contracts worth more than $144 million for Keppel DC Singapore 3 and Keppel DC Singapore 4. Keppel DC REIT acquired a data centre in Milan, Italy for EUR 37.3 million. Keppel Capital received regulatory approval to centralise certain regulated activities carried out by its licensed asset managers in addition to the non‑regulated activities. Keppel Capital saw the first closings of two new private equity funds – the Alpha Data Centre Fund and Alpha Asia Macro Trends Fund III, with initial commitments of US$410 million, out of a combined target size of US$1.5 billion. Keppel Corporation maintained its listing on the Euronext Vigeo Index: World 120. 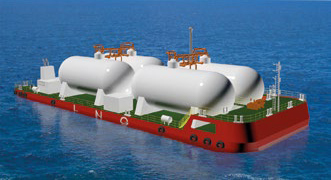 Keppel O&M secured contracts to build its first two dual‑fuel diesel LNG tugs, and signed a Memorandum of Understanding with Shell to jointly explore opportunities in using LNG as a fuel. Building on its longstanding relationship, Keppel Shipyard delivered three FPSO units to the Bumi Armada Group. Keppel Land acquired an additional 40% stake in Riviera Cove and divested its 60% stake in Casuarina Cove in Ho Chi Minh City, Vietnam. 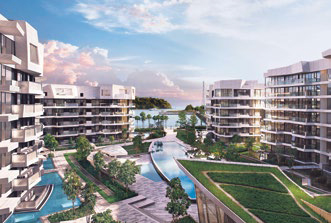 Keppel Land announced its partnership with Metland, one of Indonesia’s leading property developers, to jointy develop landed homes on a 12‑ha site in Tangerang, Greater Jakarta in Indonesia. Guangdong’s first Customs, Immigration, Quarantine and Port‑clearance post was opened in Keppel Cove in Zhongshan, China. Keppel Land and Keppel Infrastructure harnessed strengths to make Bugis Junction Towers the first Green Mark‑certified office to use renewable energy to fully power its operations. Keppel Infrastructure was named the preferred bidder by PUB, Singapore’s national water agency, to Design, Build, Own and Operate the nation’s fourth desalination plant for a concession period of 25 years. Keppel Seghers secured two contracts worth about US$40.4 million to provide technology and services to the Baoan waste‑to‑energy (WTE) plant and the Nanshan II WTE plant in Shenzhen, China. KDCH divested a 90% stake in Keppel DC Singapore 3 to Keppel DC REIT. Keppel Logistics acquired a 59.6% stake in Courex, a Singapore‑based e‑commerce fulfilment company. Keppel DC REIT acquired the shell and core building of a data centre in Cardiff, the UK, for GBP 34 million. The Alpha Data Centre Fund, in collaboration with KDCH, acquired its first data centre, Keppel DC Frankfurt 1 in Germany.